TEPCO (Tokyo Electric Power Company) announced a profit of ¥43.2 billion ($4.3 billion) for the 2013 fiscal year. It is the first time the company moved into the black since an earthquake and tsunami crippled the reactors, leading to a nuclear meltdown in March of 2011. Despite a drop in electricity sales due to higher than usual winter temperatures, overall sales increased 11 percent from the previous fiscal year due to a rate increase and fuel cost adjustments. 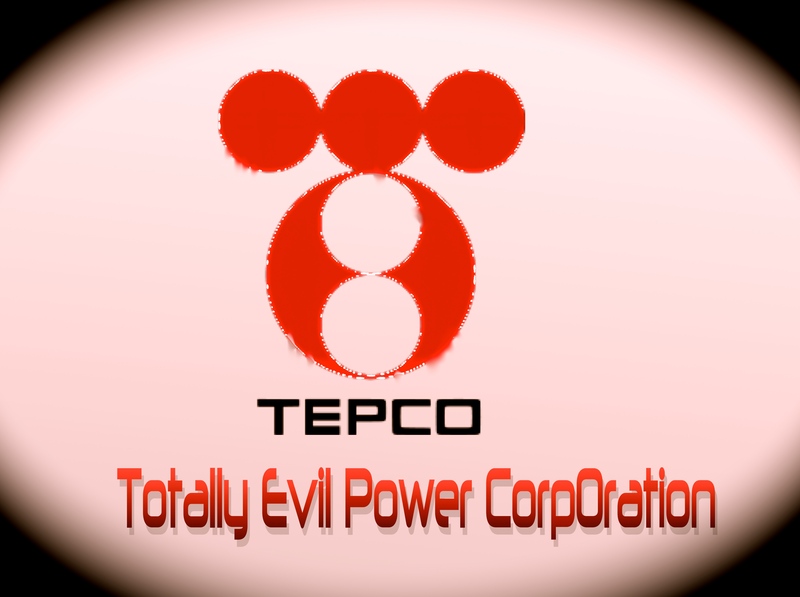 Out of ten electric companies, TEPCO was one of the four that posted a profit. The remaining six, which includes power companies in Kansai and Kyushu, recorded a deficit due to relying on fossil fuels to offset the shut down nuclear plants, according to Asahi Shimbun. Last September, the Abe administration announced that it would give ¥47 billion of taxpayer money to prevent further contaminated water from leaking from the Fukushima No. 1 nuclear plant. That amount is far greater than the profits that TEPCO posted on April 30th, meaning that if the government had not given them any money last year, the company would have announced another year of losses. The company has not made it clear what the profits will be used for and whether any of the money will be used to support supplement the taxpayer funds allocated to clean up the disaster or compensate those who in Fukushima whose homes fell under the evacuation zone. However, TEPCO’s stockholders, which include LDP politicians such as Masahiro Imamura and LDP Secretary General Shigeru Ishiba have a cause to celebrate. Both hold 6000 and 4813 shares in the company respectively. 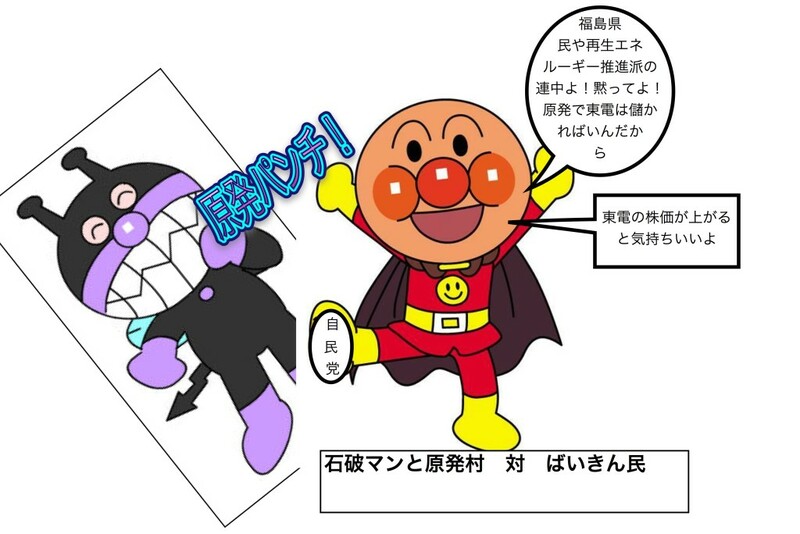 As nuclear waste continues to leak into the ocean surrounding Fukushima Prefecture, pro-nuclear advocate Shigeru Ishiba who resembles the Japanese anime hero, Anpanman, seems less like a hero, and more like the arch-villain of the series, Baikinman (Germ Man.) Or maybe in the eyes of the LDP, the general public, 80% of which oppose nuclear power are just like “germs.” In any event, for the large number of ruling party members with stock shares in TEPCO, the profits are good news; the losers are everyone else. Ishiba-man gives an atomic punch to the people of Japan and the clean energy fans in a dramatic fight to save the profitability of TEPCO–in which he owned at least 6,000 shares. Japanese rockers sing the truth about post-meltdown Fukushima. Is anyone listening? Two years have passed since the triple meltdown in Fukushima Prefecture in March of 2011. Until then the Japanese fashion subculture was dominated by the so-called “Harajuku Girls,” who became famous after Gwen Stefani’s 2004 solo pop album. However, Japan is slowly developing a post-Fukushima nuclear accident generation of artists and subculture. They aren’t singing about fashion and love; they’re singing about radiation and alienation. 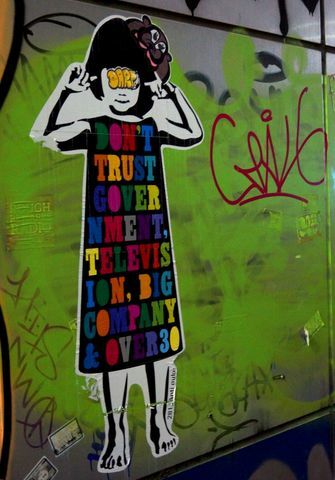 Rock and roll is the medium for telling the truth that the mainstream media no longer wants to handle. The Shingetsu Toka, aka “The New Moon Light Flowers” is a group of female musicians (28-32) who perform live rock music concerts in Fukushima prefecture and in Tokyo every month. The Shingetsu Toka also promote an NPO called “Tarachine” in Iwaki city that ensures food safety and conducts radiation measurements in Fukushima prefecture. They released their second mini-album “Living in a Radioactive Material World” this year. The title song has the punch of early Clash, the vocals on the acoustic song, “アスノメ (the eye of tomorrow) are smoky, poignant and reminiscent of Marianne Faithful–if she had been a protest singer. The live recording of 打ち砕いて (Knock it down) has in the background the enthusiastic cheers from the Fukushima local high school kids, who find their despair voiced in the lyrics of the band. The sing-along aspect of the recording gives a better sense of how united the locals are against a common enemy: the nuclear industry and the Japanese government that let them run amuck and has not (or can not) repair the damage that has been done. After the Fukushima Daiichi nuclear power plant accident of March 11, 2011, about 88,000 people have been evacuated from around the crippled power station. Yuko Yamazaki, 28, (bass and voice,) Yuko Nakano, 28, (guitar and voice,) Michiko Tanaka, 32, (guitar and voice,) Yukiko Yamagishi, 32, (drums and voice) collect written testimony and information from various sources in Fukushima and display them as little white sheets all over the concert hall. The Shingetsu Toka ask the people of Fukushima to write down anything that they feel or wish to express about what’s happening near their home since the nuclear accident. The Shingetsu Toka are very interested in what the local youth have to say. “We want them to express anything they want. We are not conducting a huge scientific study, though. We just want to know how it really is for the people who remain,” Yukiko Yamagishi, the drummer explained. The Shingetsu collects interviews with Fukushima residents and their messages, which they display at their live concerts. 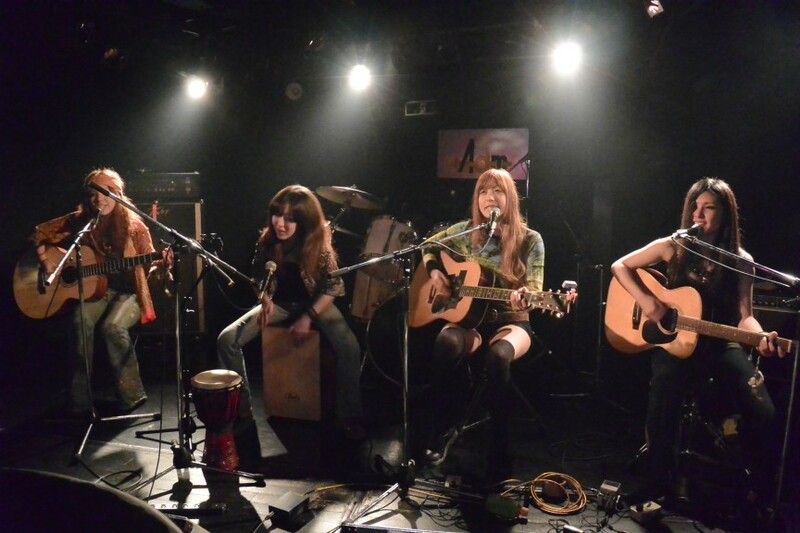 The Shingetsu Toka (“The New Moon Flowers”) was founded in 2006 when they still played acoustic music. The girls mostly grew up in Tokyo and started to play electric guitars in 2009. “When the moon is in its first phase, there is a dark side to it. We chose this name because, as an image, we want to grow flowers in dark or invisible places of our world ands shine light on the things that most of us don’t see or try not to see.” Yukiko Yamagishi said. Kenji likes to share information with them. He was mainly a tekiya or street merchant* in Iwaki, Fukushima prefecture, before the nuclear meltdown. 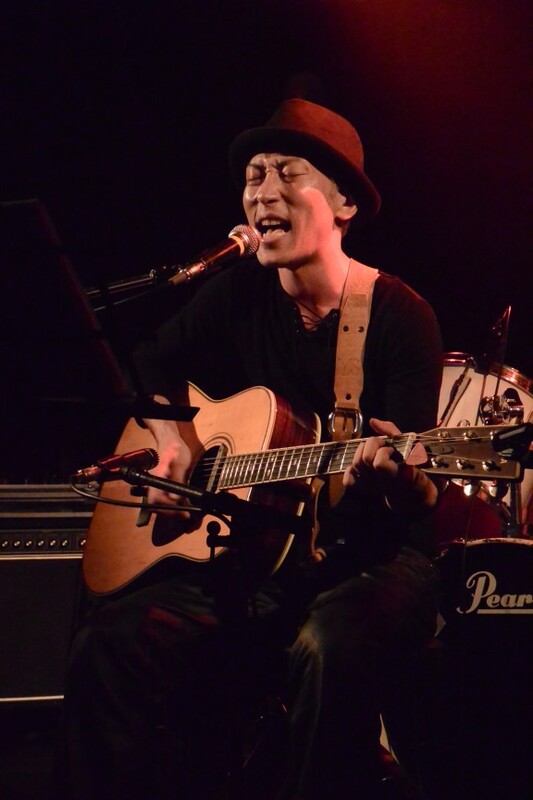 Kenji Sato plays 2 or 3 live concerts in Iwaki per month. He was invited to give live concerts in Tokyo more than four times after the Fukushima nuclear accident. Kenji Sato started to play the guitar in a band when he was at junior high school in Tomioka town, Fukushima prefecture, where he grew up. “I started working at the Fukushima Daiichi nuclear power plant in October last year. Before that I was decontaminating cars at J. Village in Nahara town, Fukushima prefecture, in the early days of the nuclear crisis.” J. Village is the name for the gated area established by the Japanese police to control the entry to the former 20 km no-go zone. 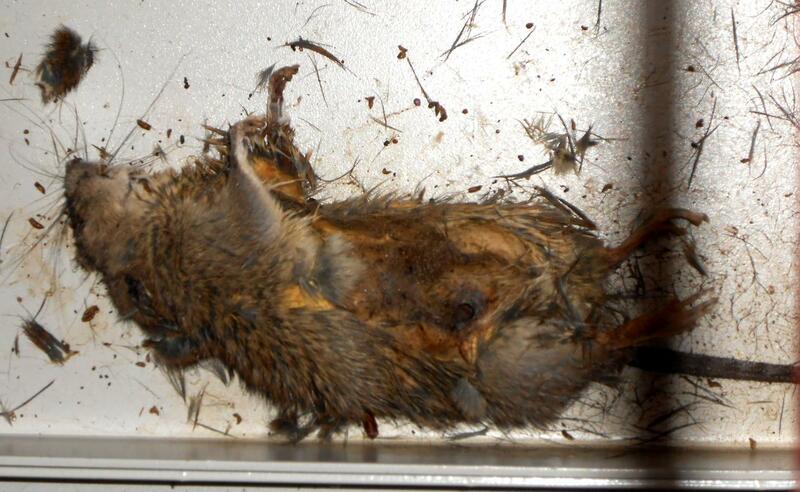 “At Fukushima Daiichi, I now do various jobs, such as decontaminating the walls of Reactor 1’s spent-fuel pool building. Currently, I am working on a project to build a facility near the main gate of Fukushima Daiichi, where the nuclear workers will undergo radiation checks. Workers do that at J.Village for the time being.” Sato explained. Kenji Sato’s family house is still situated in the current no-go zone. In April of 2011, the Japanese government designated no-go zones within a diameter of 20 kilometer around the crippled Fukushima Daiichi nuclear power plant. In early April of this year, the Japanese government redefined the no-go zone and re-opened the east costal area of Namie town and some other areas, where a total of about 20,000 people resided before the 3.11 meltdown. 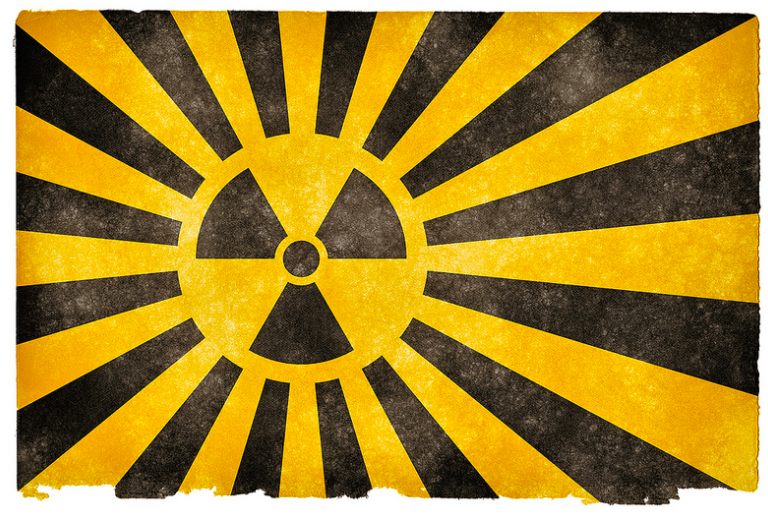 The places that are forbidden to return have an estimated annual radiation exposure exceeding 50 millisieverts. Sato cannot return to his family house in Tomioka town but was able to visit his high school during the Golden Week, together with this reporter. His parents moved to Kooriyama city after they evacuated the town. 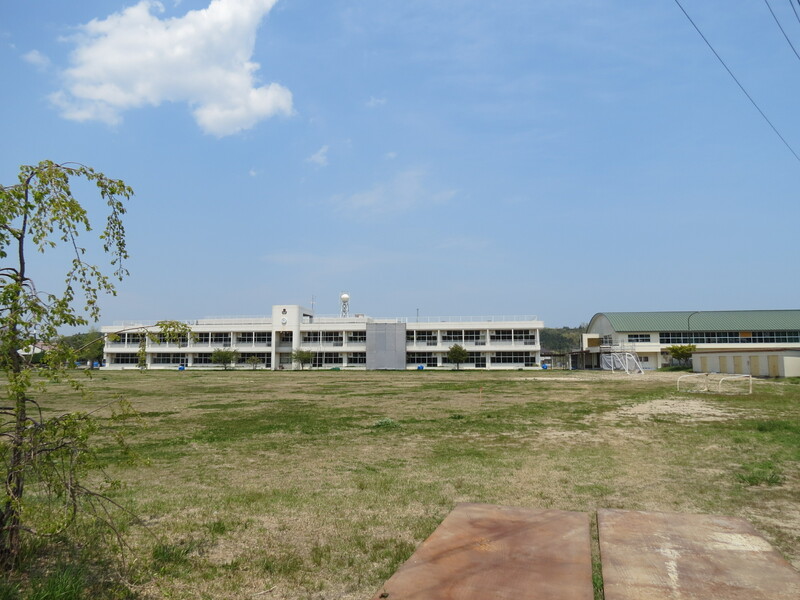 Tomioka Daiichi junior high school. The forbidden zone re-opened just before Golden Week this year. Kenji Sato said that it was hard for him to discuss certain things that are happening at the Fukushima Daiichi power station, because being associated with Tepco has became a sort of taboo. It is quite hard to work at the Fuksuhima Daiichi nuclear power plant when a majority of Japanese people, and especially those who protest against the restart of nuclear power plants in Japan, insult Tepco employees. Unsatisfied Fukushima residents and farmers are currently fighting a lawsuit against Tepco. 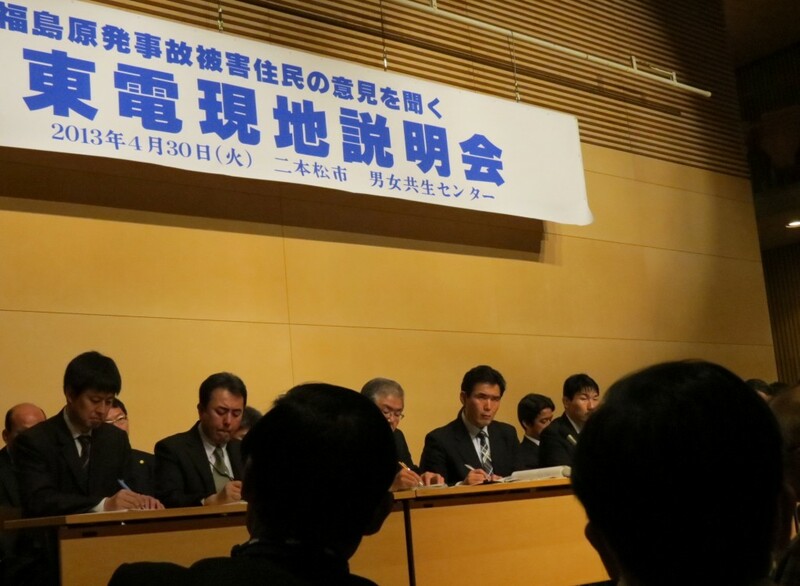 People working at Tepco are under pressure and often get insulted at public hearings. If you attend even one meeting, you can feel the hostility. There is also a great bitterness felt by those who saw what was going to happen and were ignored until their worst fears were actualized. Hideo Ouchi, 76, who is currently helping a group of Fukushima residents to receive proper compensation from Tepco for the damage caused by the nuclear accident, had opposed the construction of Fukushima Dai-ni nuclear power station 40 years ago together with 404 other residents who fought Tepco in court during more than 15 years starting from 1975. They lost. “The judges discouraged us by telling most of us that we had no rights to oppose the construction of the nuclear power plant because we lived too far from it. My house was situated about 40km away from it.” Ouchi said. 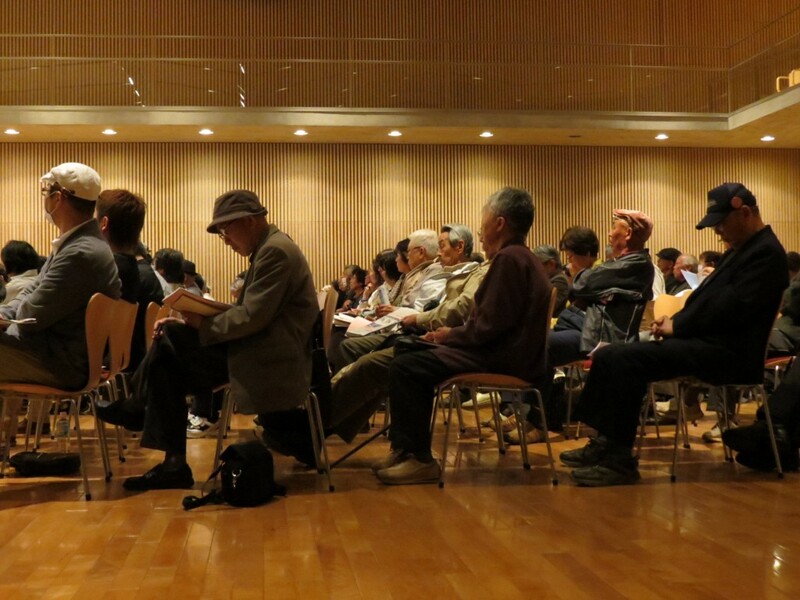 More than 260 residents, mostly elderlies participated to a public hearing that took place in Nihonmatsu on April 30th of this year. About 30 Tepco officials wearing austere black suits faced a 2 hours long Q&A session in a big hall at the Gender and Equality Center of Nihonmatsu. The crowd was furious to learn that Yoshiyuki Ishizaki (Deputy Chief of the Emergency Response Headquarters for Reliability Improvement at Fukushima Daiichi Nuclear Power Station) did not show up at the hearing as promised. April 30th, 2013. A public confrontation between Tepco and Fukushima residents in Nihonmatsu. The average age of participants was over 50 years old. The answers given by the Tepco officials on that day with regard to the compensation issue were unclear and they kept asking the crowd to request compensation to the Japanese government, as the decontamination efforts were financed by Tepco already. But “Radiation don’t stop after 20 km, you pigs!” A woman yelled in the crowd. “Would you move your family to Fukushima if you were called to work here?” Another person added. A member of Shingetsu Toka can’t help feeling frustrated by the hatred and anger caused by the nuclear accident. “Those who are cleaning up the mess at the power plant shouldn’t be blamed for their work. They are sacrificing their health for the rest of the nation. And men like Kenji do it because they need a job.” A musician from Shingestu Toka said. It’s way too cheap for someone who is risking his health.” A Shingetsu Toka member commented. Kenji didn’t respond to the question whether he was forced to sign a confidentiality clause with Tepco or another construction company for not discussing what was happening inside the crippled power plant. “I work at the crippled power plant because I need to make a living. I am used to radiation, so I can’t say that I’m afraid of it.” He said. Kenji Sato works there every day of the week. It depends on the job, but usually between 3 to 4 hours per day inside the nuclear power plant. In summer there is a limited amount of time to work because of the heat. Otherwise there are no time limits for the daily work. “It depends on the job we’re assigned to do. Sometimes we have to do it until we finish it.” He explained. It takes him between 10 to 20 minutes everyday to get dressed in his anti-radiation suit and mask. Kenji Sato’s songs are often sad and dark. He sings songs in a powerful voice, you would never imagine could come of his frail skinny body. He is not a professional yet, but he is hoping that in the future he can earn his life being a singer and musician, not as nuclear power plant salvager. Although, the cover-up of the magnitude of the disaster at Fukushima continues, Kenji Sato and Shingetsu Toka make sure that at least the voices of the people are heard. The truth can be covered up but not silenced. The question remains as to how many people in Japan are really listening. Shingetsu anti-nuke girls band in Ikebukuro. *Tekiya (street merchants) are sometimes considered a type of yakuza but not all yakuza are tekiya and many tekiya are not yakuza. Tora-san, of the famous film series, is a tekiya. Posted on November 18, 2013 November 1, 2015 Author jakeadelsteinCategories Contemporary Culture, Featured, On the Record, Photo Essays, Politics, Pop Culture, Reviews, Underground EconomyTags labor, nuclear folly, protest, rat, rock, TEPCO12 Comments on Japanese rockers sing the truth about post-meltdown Fukushima. Is anyone listening? The tale of Tanaka Minoru, the journalist who took on a much feared kingpin in Japan’s nuclear industry, Shiro Shirakawa, and who was sued for nearly $670,000, ended happily. Mr. Shirakawa folded. Mr. Tanaka and his supporters celebrated his semi-victory last week. The lawsuit was officially dropped in August but the party was a long time in coming. Although with new legislation on the horizon to darken the changing landscape of freedom of the press here, the celebration was very short. Last week, on October 18th, more than 50 people with different backgrounds: reporters, editors, politicians, singers and actors gathered in the basement of a Tokyo building to celebrate the rare victory of a journalist against a SLAPP (Strategic Lawsuits Against Public Participation) lawsuit. Strategic Lawsuits Against Public Participation (SLAPP) are designed to censor and silence individual reporters or independent media by forcing them to pay the cost of a legal defense; by doing so- it ruins them financially. These kind of lawsuits are penalized in California and many places in the United States but in Japan, there is no legal protection. The journalist or media outlet who is sued loses (financially), even if they win in court. All those present at Minoru Tanaka’s victory celebration were people concerned about freedom of the press, and the very essence of democracy, now in danger in Japan as a new secrecy bill is about to pass. Minoru Tanaka’s story is the story of one man, one journalist. He was sued in 2012 for a story he wrote about a shadowy figure in the Japanese nuclear industrial complex, also sometimes called the nuclear mob (原発マフィア). The plaintiff found the story embarrassing and of course, as always in these cases, he had the financial power and luxury to launch a legal assault on the lone reporter. In his article published on December 16th, 2011 in Weekly Friday (週刊金曜日), Mr. Tanaka, who has long been investigating and reporting the shady side of Japan’s so-called Nuclear Village also known as the Nuclear Mafia (原発マフィア), focussed on one kingpin. There are few reporters who have a better sense of the complicated relations between politicians, electric power companies, media tycoons, advertisement agencies, construction companies and of course, the Japanese police and the Japanese mafia. The reward for his magnum opus was being sued for a total of 67,000,000 yen by one of Japan’s most powerful nuclear industry businessmen, Shiro Shirakawa, for damage and defamation. Mr. Shirakawa, a former secretary to LDP Diet member and power broker, Hiroshi Mitsuka, is well-connected and has great influence in Japanese society. It was the first time in Japan that a journalist was sued individually for an article he wrote, but not the magazine that published it. Minoru Tanaka is a hero for some of his supporters. He says he simply did his job as an investigative reporter and was punished for revealing the truth to the public. Tanaka researched, perhaps too deeply, into the ties that connected Shiro Shirakawa, the plaintiff, to Hiroshi Arakawa, former chairman of TEPCO and also Shirakawa’s alleged links to member of organized crime, the yakuza. Shirakawa, is also the president of New Tech, a company that offers security services to nuclear power facilities. He was reportedly suspected of asking help to gangsters to stop the publication of certain materials and diverting huge profits made in land transactions to politicians. 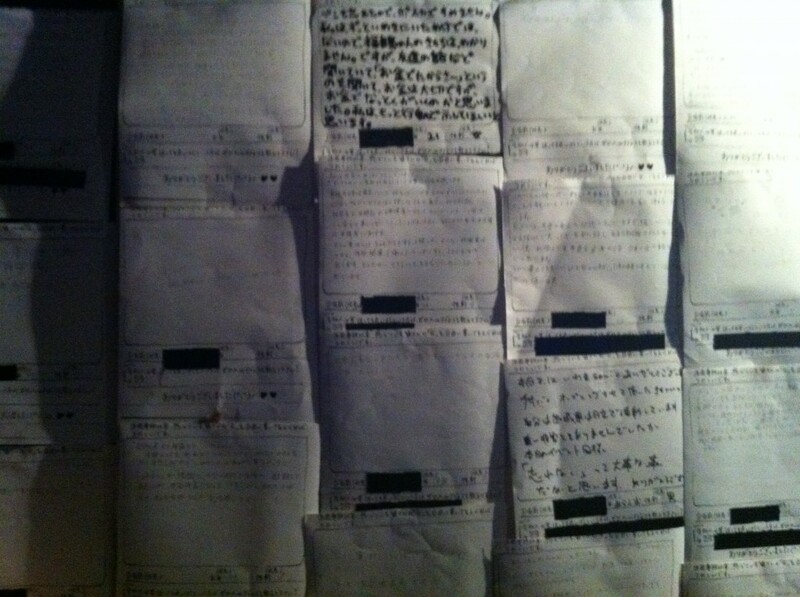 Tanaka’s article also revealed the connections between Shirakawa and Diet member Kamei Shizuka as well as a former high-ranking police official. Shirakawa has also allegedly made death threats to newspapers who interviewed him, resulting in his name often being dropped from articles and the letter “S” being used instead of his name. Tanaka was lucky to get the article published. 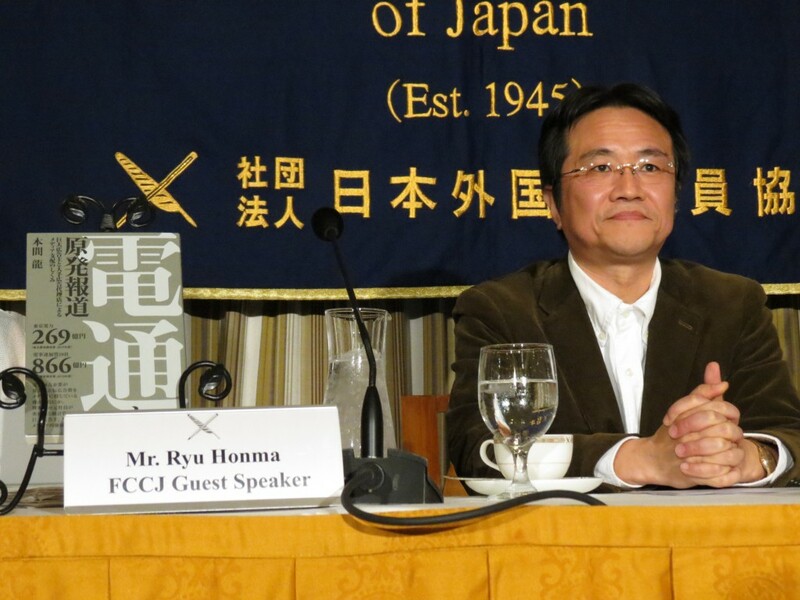 Unlike the salaryman reporters at the gigantic Japanese media outlets, he didn’t have to hit his head against the wall of top editors and media tycoons higher in the media hierarchy, who are themselves connected to the nuclear industry and the ruling politicians. However, as a a freelance reporter, he was unlucky that he didn’t have a huge newspaper to pay his legal expenses either. “SLAPP are made to destroy your every day life. You can’t work anymore. Every morning when I woke up I had the number 67 million yen floating over my head. It was hell. I couldn’t focus,” Minoru Tanaka said at a speech during the celebration party. Civil servants as well as journalists could face up to 10 years in jail if they reported national secrets under the proposed law. Although all countries have legislation for national security—classified information—it is questionable why Japan is changing its law now. The DPJ-led government began to contemplate such a law after a video taken by a Japanese Coast Guard official showing the attack of a Chinese fishing boat against Japanese coast guard boat near the Senkaku Islands was leaked in September 2010. The official line was that it was a collision and not that the Chinese fishing boat was the aggressor. The case also illustrated the perils of protecting sources in Japan and the difficulty of officials speaking to the press. The U.S. reportedly urged Japan to pass such law to protect information related to national security, defense, diplomacy, counter-intelligence and counter-terrorism. However, judging by past history, the law will most likely be used to muzzle any whistle-blowers, or the release of information that might embarrass Japanese politicians or Japan. Mr. Tanaka’s next quest is to work with other journalists to make sure that SLAPP actions are aggressively slapped down and that new laws don’t infringe on Japan’s freedom of press. Unfortunately, the lawsuit against Mr. Tanaka and the contents of his article have been more or less ignored by the mainstream Japanese press. Freedom of the press exists in Japan but in reality, many media groups shy away from using that freedom; they remain caged in a box of their own fears and lack of resolve. Fukuppy–the mascot of Fukushima Industries has a name that invites sniggers when pronounced in English. It has been incorrectly reported that the character was created as a mascot for Fukushima Prefecture which suffered a triple nuclear meltdown in March of 2011—largely due to the f*ckups of Tokyo Electric Power Company (TEPCO) and the Japanese government which was supposed to oversee the nuclear industry, not be its cheerleader. The nuclear disaster there is still an ongoing crisis. The company has no direct links to Fukushima Prefecture. The founder of the company, Nobuo Fukushima (福島信夫) has the same family name and kanji characters as Fukushima Prefecture (福島県). The firm was founded in 1951. 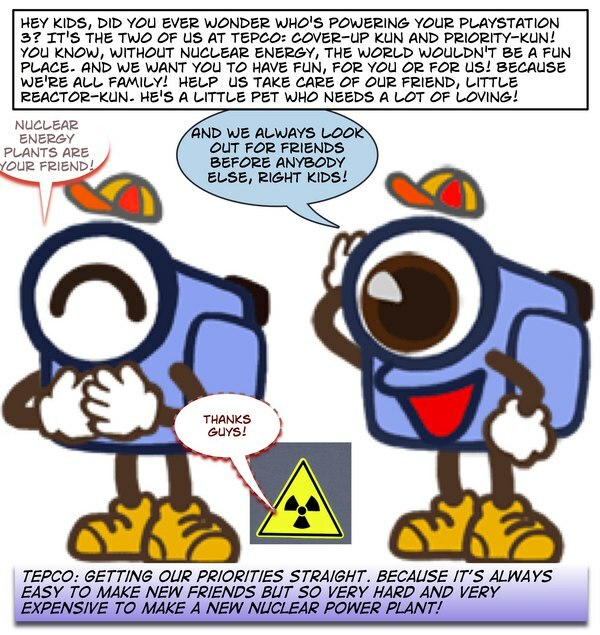 The text above the illustration of Fukuppy, announces that he was born as a corporate character for Fukushima Industries. He introduces himself as “Fukuppy” and says the Japanese equivalent of pleased to meet you, “よろしく（yoroshiku)”. The meaning for “yorishiku” could also be taken as “please be nice to me”. Unfortunately, that request has fallen on deaf ears in the Western world. For those of you who can’t get enough of Fukuppy and especially for those who could care less, here’s everything you never wanted to know and didn’t ask. I was born in the refrigerator of Mr. Fukushima. Fukuppy, what’s your personality like? I love to eat and I’m very curious. I’m gentle but with a strong sense of justice. Some people say I’m a little spacey and absent-minded. But I always am polishing myself to shine bright. Fukuppy, what’s your job and your skills set? What do you bring to the table? I fly around patrolling the freezers in Supermarkets and showcases with my special wings! I’m proud of them. I can talk to vegetables, fruits, meat, fish and see if they’re healthy. In addition, in order to bring happiness to the world, I have the important job of continuing to give birth to new exciting products–one after another. We tried to contact Fukushima Industries today to get their take on their new mascot and their views on the silliness of his/her name, but unfortunately since it was Physical Education Day (体育の日）in Japan, we weren’t able to get an answer. So we went to the gym and worked out for a few hours. We hope Fukuppy got the day off , too. Accept for the unfortunate reporting mistaking him as a symbol of Fukushima Prefecture, he’s already worked very hard this week to provide merriment to the English speaking world. It will be interesting to see whether Fukushima Industries views the name of their mascot as a “f*ck-up” or tells the western world to go fukuppy themselves. misunderstanding among a great many people. misunderstandings and offered their opinions. name, and the course we will follow going forward. as well as the name itself. Note: This article was originally published Monday, September 2nd 2013 at 7:54 pm as a dark joke about the nuclear industrial complex in Japan. On September 3rd, the Japanese government basically provided the punchline by announcing plans to spend 47 billion yen to clean up the water crisis at Fukushima. The whole thing has an artificial aftertaste that makes Campbell’s pasta in a can taste delicious in comparison. If you would like to know what I’m talking about, read on. Tokyo Electric Power Company, TEPCO, is getting a lot of criticism for its inept clean-up attempts of the Fukushima nuclear power plant site, which had triple-meltdowns in March of 2011—after the company had failed to take precautions which might have prevented the meltdown in the first place. There is also a 4th reactor where spent fuel rods are waiting to be extracted, and if mishandled they have the potential to release huge amounts of radiation into the air. TEPCO, like the Central Intelligence Agency, has a wonderful legacy of failure, and now it literally has “a legacy of ashes”. There is already close to 300 tons of contaminated water leaking from the plant into the ocean. The Nuclear Regulation Agency of Japan on September 2nd noted that an even more serious concern was large amounts of radioactive materials leaking into the ground water as well. On September 1st, it was reported that at one of the 1000 water tanks on the site, radiation levels were 18 times higher than previously measured–a whopping 1800 millisieverts. The reason the high levels hadn’t been detected earlier was that the devices near the leaking water tank maxed out at 100 millisieverts. You can’t detect what you can’t measure. So I thought about it. And thought about it. And then I realized what the answer is. It has to do with spaghetti-os. I’ll explain later but the essence of what they’re doing is very simple. TEPCO is doing the worst possible job possible because every yen spent cleaning up the site cuts into their profits and the more they show themselves to be incapable, the greater the chance that the government (which already is their de facto owner) will take up the slack. It’s a brilliant plan. When the Japanese government steps up, they can step down and get back to business: selling energy and making money. The Government of Japan will essentially reward them for their incompetence. I call this the Spaghetti-Os principle: the best way to avoid doing work you don’t like is do it just badly enough that no one will ever trust you to do it again, but not so badly that you get punished (or spanked) for it. My little sister was the first to discover this principle, when she was about 10 and I was 13. During that time period, my parents had decided to institute a cooking night for each of us children, to teach us responsibility. One night per week, we were expected to cook dinner for everyone. I cooked Barbecue Ramen Surprise and other fusion cuisine delights. I liked to cook. But my sister, Jacky—she was not into it. So after a few weeks of this, she managed to end the whole fiasco with one amazingly awful meal. 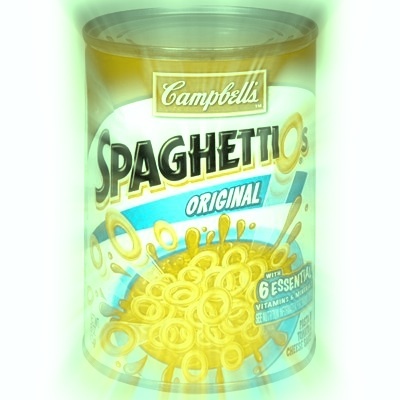 She bought an industrial size can of Spaghetti-0s, a sort of processed pasta dish that tasted awful and looked worse, and she heated it up and served it to us. That was it. The whole meal was Spaghetti-os slopped into five bowls with a side of burnt Wonder bread toast, mangled with cold butter. It was so inedible and disappointing that we all agreed to end “cook dinner for everyone night” that very night. After that, Dad cooked most of the meals. After all, it was crazy to ask Jacky to be a chef. We just assumed that at 10, she just didn’t know how to cook. It was only years later that it dawned on me that she had deliberately made the worst meal she could within limits—not because she didn’t know how to cook, but because she didn’t like cooking. She preferred to play with her Barbie dolls or read books or watch TV. Every time TEPCO screws up at Fukushima, they’re loading a spoonful of tangy inedible Spaghetti-os on our plate. Sooner or later, when we can’t take it anymore, Dad or Mom, is going to take the spatula away and TEPCO will be free to go back outside to play. Because TEPCO knows that judicious incompetence is its own reward. It’s not that they are unproductive or lazy—they like to make messes, but like any spoiled little kid, they just don’t like to clean them up. That’s no fun. Cleaning up after the birthday party, that’s what parents are for. Soft-spoken and shy, one Japanese man comes off as extremely eccentric at first sight. 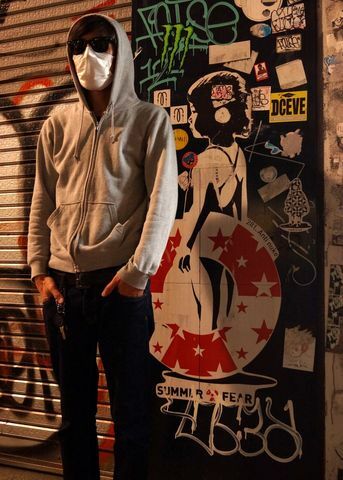 Far past sundown and in Tokyo’s humid summer night, he hides his face behind a pair of dark sunglasses and a white face mask. His real name is unknown, but you can call him 281_AntiNuke—or if that’s too much of a tongue twister, 281 or Nuke-san for short. As unassuming as he is—if you ignore the white face mask and the sunglasses, which stands out far too much—many are fascinated by him. One documentary maker has made him the subject of his upcoming film. He has been featured in publications such as The Economist and Rolling Stone Japan. A documentary is soon to be released on his mini-crusade. He’s left his mark all over Tokyo: large anti-government, anti-nuclear stickers which have been stuck mostly on public property. His work is even good enough to be highlighted at a Tokyo art space called The Pink Cow. But with all this fame come danger: Japan’s online right wing community have made him their next target. Sending him constant death threats, they are determined to unmask him and have him arrested in order to silence him. While Japan’s online right wingers—or netto uyoku—target him, 281 targets TEPCO and the Japanese government for their irresponsibility following the events before and after the Fukushima meltdown, but his anger at the two has never always been there. One can understand that anger as the Japanese government and the nuclear industry began to push to move nuclear reactors back on-line while almost every day new revelations of disastrous radiation leaks and mismanagement from the Fukushima Nuclear power plant—run by TEPCO–are reported. Before March 11, 2011, 281 lived the average life of a Japanese male. “Before the earthquake my art was limited to drawing art for myself or for my friends. I didn’t really live my life as an artist,” he said. His participation in the political sphere was virtually nonexistent—at least minimum if one counted the fact that he dragged himself to a voting station whenever an election came around. His attitude towards politics took a 180 degree turn after the nuclear accident. The weeks following the meltdown were registered with shock, but soon that feeling was replaced with outrage. “As I watched news reports from foreign media outlets, it took me at least two weeks to understand the situation, but I was slow to notice what had happened,” he said. Inspired by artists such as Taro Okamoto, whose depiction of the effects of an atomic bomb are famously shown on a mural in Shibuya station, and Chim Pom, who added to the mural after the accident, 281 wanted to find an outlet for his anger and a way to contribute to the anti-nuclear movement. It was then that he turned to street art. But his art came with a risk. As word of his street art spread, Japan’s netto uyoku—online nationalists—have mobilized to take him down. While there are those who would classify his works as art, others denounce them as prank posters and vandalism. Revealing his identity can mean arrest for defacing property. 281 hides behind his disguise and when meeting The Japan Subculture Research Center, warned us against photographing anything identifying features. His main means of contact with others is through Twitter. Still, that hasn’t stopped Japan’s net uyoku from sending him death threats or even putting his official website offline. His scheduled appearance at the opening party for his art showing was canceled at the last moment—despite assurances that there was a back entrance through the kitchen should the art space be overrun by anyone wishing to carry out a death threat. Although activists like 281 who risk their safety to put on their message, the anti-nuclear movement is a losing battle. On December, 2012, the pro-nuclear LDP was voted back to power, and Shinzo Abe was given another chance to lead Japan. “I was shocked and disappointed at Abe’s win,” 281 said. When Abe made his comeback, shutting down and dismantling Japan’s nuclear power plants was taken off the agenda. The LDP are staunch supporters of nuclear energy, and during their campaign to take back the lower house, they stated that they would restart all of Japan’s offline reactors after ensuring that the facilities are safe. Last December, the LDP was voted back into power, giving them a majority in the lower house. The number of seats for Japan’s traditionally anti-nuclear left-wing parties dwindled to almost nothing. “It was as if everyone forgot the accident,” 281 said, in response to the willingness of voters to bring back the very people who champion the benefits of nuclear energy. For months, the Abe’s cabinet has enjoyed a support rate hovering over 70 percent. The truth is written on the alley walls. 281 is also fighting to keep his art seen on the streets. Many of his stickers in the Shibuya area have been covered up by other graffiti from other artists or scratched off, likely by the owners of the buildings themselves. This defacement of his work, 281 says, is symbolic of how the government and TEPCO have tried to cover up and erase the nuclear meltdown. 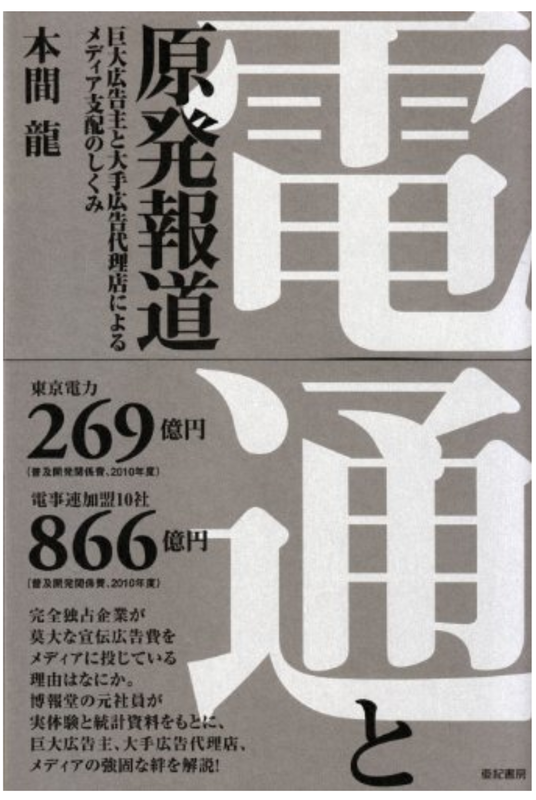 Nonetheless, the criticism, threats, and the near disappearance of the anti-nuclear movement in Japan doesn’t stop 281. At night this nameless, faceless activist roams the streets putting up his art and hoping that his message will be heard. Last month his work was featured in a public art space, The Pink Cow, for the very first time. 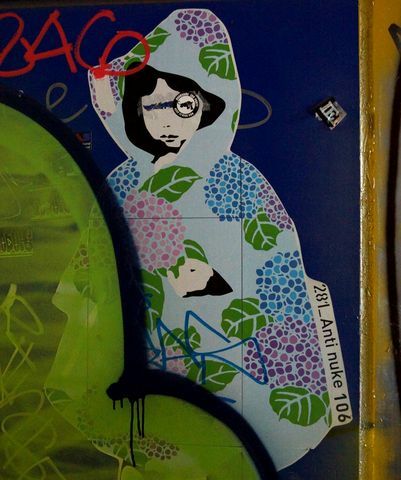 In addition to his earlier pieces such as the little girl in the raincoat—of which 162 different variations exist as of now—other pictures show how 281 is branching out and addressing non-nuclear issues. For example, one piece which invokes images of Nazi Germany shows Abe standing on a hybrid between a campaign car and a military tank. Beside him is a solider manning a machine gun. Other pieces criticize big companies such as Uniqlo for corporate greed or former Prime Minister Yoshihiko Noda for his strong support of raising the consumption tax. While the memory of the nuclear meltdown fades from the public consciousness, 282 walks a lonely road to remind people what has happened and warn them of what may happen again. Although the crowds which once loudly denounced nuclear energy in front of the Prime Minister’s building no longer gather with the force they had a year ago, this lone artist will continue to oppose a source of energy that he believes Japan must give up. He is waging a quiet war using the streets of Tokyo as his art gallery, his battleground and his voice. Judging by opinion polls which suggest that most Japanese people do not trust the nuclear industry or nuclear power, he is speaking for more than just himself. All photos were taken by ©Lilia Sonntag. Japan is a giant nuclear pressure cooker. Let’s hope it doesn’t get set off. full article is in the Japan Times (May 5th, 2013) On April 15, two alleged terrorists in Boston killed three people, injured more than 170 others and terrified a nation — for about $100 it cost them to modify pressure cookers into bombs. We should be glad they didn’t come to Japan, where they may have been able to explode a ready-made nuclear dirty bomb, kill untold thousands, render huge swaths of the country uninhabitable — and get paid by Tokyo Electric Power Co. (Tepco) in the process. I wish I were kidding. Japan has more than 50 gigantic nuclear “pressure cookers” ripe for exploitation by terrorists. And they wouldn’t even have to lay siege to the facilities. Instead, they could just walk into a nuclear plant and leave with enough weapons-grade plutonium for a small atomic device — which later could be detonated wherever they chose. How? 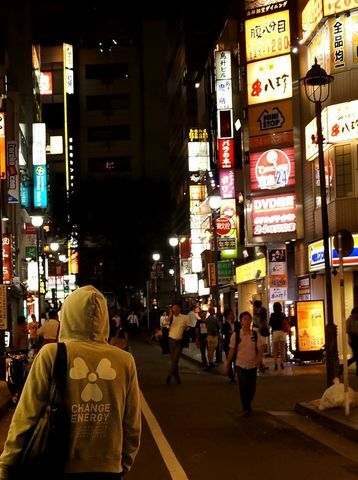 In Japan, getting access to a nuclear power plant is very simple: fill out a job application. For another view of the problems at Fukushima Daiichi Nuclear Power Plant and Japan’s nuclear security problems, Professor Kingston’s recent article: Power Politics: Japan’s Resilient Nuclear Village is a very succinct and chilling read. TEPCO is beyond parody sometimes but we try. Strong in the Rain: Surviving Japan’s Earthquake, Tsunami, and Fukushima Nuclear Disaster by Lucy Birmingham and David Mcneill is a book with the literary density of uranium, it penetrates deeply and leaves the reader with a personal and factual understanding of of Japan’s 3/11 mega-disaster that a simple narrative could never do. The title, is of course, taken from the well-known poem by Kenji Miyazawa about perseverance and compassion. Almost every one in Japan knows the poem–that does not detract from its message. 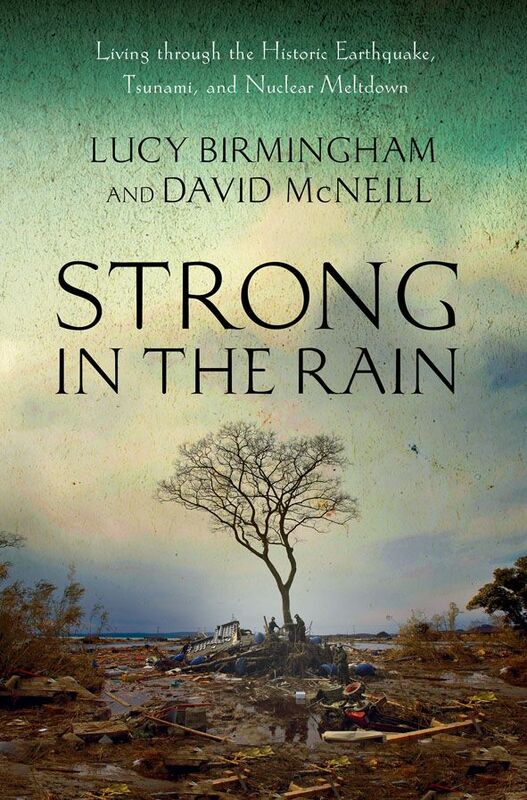 Strong In The Rain is perhaps the best book about the events of 3/11, the aftermath, and the lessons that were learned and should be learned. The most appropriate expression I can use to describe the book is from the Japanese 痛感 (tsukan) literally to “feel pain” the metaphorical meaning being “to keenly know” something. I wasn’t in Japan when the earthquake and the meltdown devastated the nation; I came back 10 days later. This book makes me feel like I was there–like I lived through it. It’s that powerful and evocative. I know both the authors, so maybe I’m not objective. But this is a powerful and almost majestic book. It’s a book I wish I had written…or could write. The message of “Strong In The Rain” in its tale of foreign and Japanese heroes and villains–and there are both, remains with the reader long after the book is done. Because the book forces us to face the core of our existence: what is it to survive, who do you save and who do you leave, when do we stand up and when do we shut up? What is it be a hero? It is a book about some amazing Japanese heroes, like the Mayor Sakurai, who fought the yakuza, the complacent press, the Japanese government, and the nuclear industrial complex that is sometimes referred to as “the nuclear village” or by those in the underworld as “the nuclear mafia.” He’s not an action hero–he’s a man of action, a man who changed the coverage of the nuclear meltdown with a simple heartfelt video uploaded onto You Tube in two languages. He becomes the embodiment in the text of the best qualities of the Japanese spirit and character. Ms. Birmingham and Mr. McNeill deftly weave together the accounts of the victims and heroes into a Rashomon like account of 3/11 that creates a 4D picture of the tragedy and it does it without the moral relativism or ambiguity of Akutagawa; some problems are painted in shades of grey, but the authors have the courage to put things in black and white where it matters. Sometimes, there is a right and a wrong, a true and false. The message of “Strong In The Rain” in its tale of foreign and Japanese heroes and villains–and there are both, remains with the reader long after the book is done. Because the book forces us to face the core of our existence: what is it to survive, who do you save and who do you leave, when do we stand up and when do we shut up? What is it be a hero? You don’t have to be a Japanophile to appreciate the human drama in these stories. Anyone who lives in a country where there is nuclear power and natural calamity will find something of interest in this tome. The message of “Strong In The Rain” in its tale of foreign and Japanese heroes and villains–and there are both, remains with the reader long after the book is done. Because the book forces us to face the core of our existence: what is it to survive, who do you save and who do you leave, when do we stand up and when do we shut up? What is it be a hero? The book provides the questions and some answers. The book is very dense in that important facts are sometime buried in one or two simple sentences. Blink and you miss something important. It’s not an easy read but it is rewarding. Entire books could be written on the cowardliness of the mainstream Japanese press–SIR does it in a few paragraphs. Books about disasters come and go, there half-lives are very short. How many books were there on the financial crisis? How many diatribes written about Goldman Sachs? Most of them are no longer on the bookshelves and only a few will remain in the libraries. 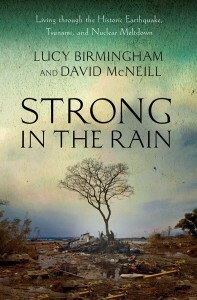 “Strong In The Rain” is a book that I think will weather the passage of time very well. Because there are universal truths in the book about heroism, mortality, disaster and Japanese culture that still be relevant long after the physical evidence of Japan’s greatest natural and man-made (nuclear meltdown) disaster are covered up in dirt and concrete.